(c) bnature 2018. All Rights Reserved. 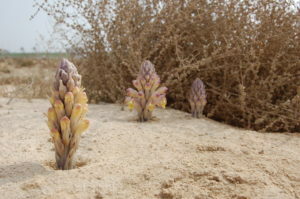 Description: One of the most dramatic of Bahrain’s desert flowers, the desert hyacinth literally forces its way up through the ground in late January and early February, to produce a pyramid of waxy flowers topped by mauve buds which open up as the plant grows. One particularly interesting feature of the desert hyacinth that is not seen in other species of the same family, is that it is a parasite. Its seeds are able to lie dormant in the ground waiting for the rains to initiate growth of the host plant, a member of the Chenopodium genus. As soon as one of the wide reaching roots of the goose foot comes within a few milimeters of the seed, a chemical reaction is triggered which initiates growth of this unusual flower. Hill, M. (2003) Wildlife of Bahrain.